Jumbo polyester stems. Bendable chenille covered wires add fun to a craft project. Use to make flowers, stems, animals and much more. Bright colors make crafts pop. Reusable. Material(s): Metal Wire; Polyester; Color(s): Assorted; Size: 12" x 6mm; Age Recommendation: Ages 8 and Up. 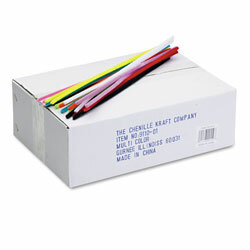 12" X 6Mm Multicolored Craft Supplies from Chenille Kraft Company! 240 In Stock today.